. . . [in the Sibelius concerto] it's the strength and passion of her playing that shines through . . . a rounded, vibrant performance. She has red-blooded support from the Philharmonia Orchestra under Vladimir Ashkenazy, and with them makes something punchy of the cross-rhythms in the final movement . . . [Glazunov / Suite for Violin & String Orchestra]: Yoo is a convincing advocate, lavishing thick, dark tone on its long melodies . . . the Grand Adagio from Glazunov's ballet Raymonda gets a performance the sumptuousness of which is entirely fitting. [Yoo]: In this showcase recording, she is a ubiquitous presence in partnership with Vladimir Ashkenazy and the Philharmonia Orchestra . . . What strikes you most is the richness of Yoo's tone, combined with a radiant intensity in the Sibelius concerto, and joie de vivre in the Glazunov. She oozes confidence, rhythmic vitality, and a natural expressiveness that gives every phrase an engaging presence and freshness of thought. The Philharmonia provide sumptuous support.
. . . Esther Yoo offers an impressive debut disc . . . she has all the technique and temperament one would expect of a competition finalist . . . She brings great affection and even, perhaps, a touch of crusading zeal to the Glazunov, relishing its melting second theme and using her bright tone to good effect in the more energetic passages . . . The Grand Adagio from Glazunov's "Rayrnonda" is a welcome bonbon from a violinist whose future development should be well worth watching . . .
Esther Yoo proves to be a charismatic interpreter of these perennially favourite Violin Concertos . . . [the Glazunov piece] has many delights that are here made ravishing through affection and skill. Yoo commands a rich tone that can be pared to something silver-fine and her dynamic range is wide while her technique is excellent and music-serving. She is also well accompanied by the Philharmonia Orchestra and a very supportive Vladimir Ashkenazy who has this music -- fantastical and lyrical -- in his veins. Clearly violinist and conductor are of one mind, and he makes sure that the beguiling orchestration is beautifully lucid, while she makes a handsome job of the extended cadenza. The Finale, without losing impetus, is given time to breathe and conjure images . . . Ashkenazy's strong affinity to Sibelius shines through in this winning reading of the Violin Concerto,] emerging fresh and vividly communicative . . . it's apparent that this is going to be a something-special performance. Such promise is not denied. Yoo is very expressive throughout, she is as intensely poised and then as fiery as you like, and her full timbre in high-lying passages is notable. It's a smouldering account, biding its time to full emotional release, first in the unstintingly sympathetic orchestra and then in a full-on cadenza, Yoo unfazed by its technical hurdles . . . and -- this is the moment that puts this version in the top bracket -- the tempo for the Finale is suitably moderate (Sibelius's "ma non tanto" is ideally observed), perfect in fact . . . The recording is excellent, naturally balanced, the orchestra sharing the limelight, Yoo establishing herself through personality rather than being highlighted. 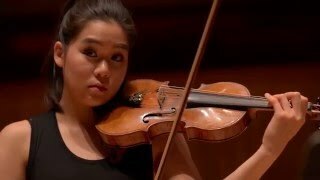 All in all, this is a very distinguished release.
. . . [one of Esther Yoo's assets] is her directness and force, which come to the fore as she seizes the limelight in the well-thumbed Glazunov Concerto in A Minor. Retaining a sweet tone throughout . . . she and conductor Ashkenazy aim to make their performance an event, and for me they succeed . . . [Yoo plays Glazunov's Grand Adagio] sensitively and with respect for its sentimentality . . . [in the Sibelius concerto, the Philharmonia plays well] and is captured in excellent sound . . . [and Yoo, I find, is] a superior interpreter . . . with considerable confidence and projection of the solo part -- she completely holds the stage in the first-movement cadenza, for example. There are no mannerisms in phrasing or affected tempos . . . The last movement, of the Sibelius Suite, "In the Summer," is a "moto perpetuo" that Yoo plays with winsome delicacy . . . [Yoo] displays all the promise of an outstanding violinist headed for a lasting career.
. . . superb violin playing . . . [Yoo] has outstanding technique and a wonderful tone. The Glazunov Concerto in A Minor Op. 82 gets a ravishingly beautiful performance here, as does the Sibelius Concerto in D Minor Op. 47, with Ashkenazy finding some subtle and often unheard nuances in an exceptional orchestral accompaniment . . . [Glazunov's Grand Adagio] is a lovely end to a simply stunning debut. Drapée dans les couleurs chatoyantes du Philharmonia, son approche du concerto de Glazounov séduit par un lyrisme mesuré, le beau grain de sa sonorité et l'absence de tout effet superflu. Dans le sombre concerto de Sibelius, Esther Yoo fait preuve d'aplomb et d'énergie pour résister aux assauts d'un orchestre majestueux aux plans superbement dosés . . . C'est dans l'Adagio que ce chant chaleureux apparait le plus convaincant . . . [le "Grand Adagio" de Glazounov c'est un] éloigne radicalement de la tension dramatique du concerto pour retrouver la fraicheur innocente de ses "Humoresques". Compléments habiles: c'est dans ces deux pages oubliées que la jeune Esther Yoo se montre captivante. Yoo, who just recently joined the Deutsche Grammophon family, releases her debut album presenting violin concertos by Sibelius and Glazunov in February 2016. On her album she is accompanied by the Philharmonia Orchestra under the baton of Vladimir Ashkenazy.